March 25, 2019 – A product of evolving awareness on the importance of tackling environmental, social and economic challenges in Mexico’s artisanal brick production, nearly 100 local brick producers, brick experts and other related actors convened in Tlaquepaque Mexico to create the Mexican Alliance for Sustainable Ceramic Production (or AMEPROSCE, it’s Spanish acronym). The Alliance marks a critical evolutionary moment in recent debates around in Mexico’s State of Jalisco over the future of the ceramic sector, which includes bricks, pottery and other ceramic goods. Traditional brick making generally utilizes outdated technologies which spew copious amounts of black soot and other toxic gases into the air, affecting air quality which in turn affects human health of workers and nearby populations, and contributes significantly to climate change. 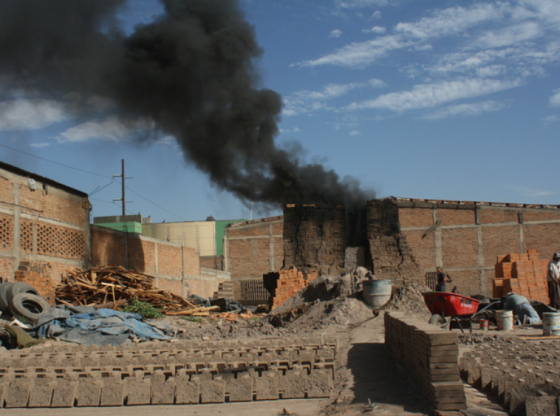 The Mexican Government, in Collaboration with the UN’s Climate and Clean Air Coalition (CCAC), as part of its national Climate Strategy, has moved recently to tackle air quality from artisanal brick production. According to an inventory carried out by Mexico’s Institute for Ecology and Climate Change, there are some 17,000 artisanal brick ovens throughout Mexico, of which about 2,800 are located in the State of Jalisco. Artisanal brick producers generally utilize antiquated means for firing clay bricks, in which they pile bricks in a large cubical manner, leaving open spaces beneath the cube, and then burn firewood, trash, old tires, or any other materials they can obtain, for days on end to cook the clay bricks. Since engaging with the CCAC, the State of Jalisco has started to engage with the artisanal brick sector, carried out studies to determine action strategies to improve production efficiency and reduce contamination, and has recently adopted a new regulatory framework to steer the sector towards more sustainable production methods. Groups from local brick cooperatives from around Mexico attended the event, including from Michoacán, Guanajuato, Puebla, Querétaro, Durango, Zacatecas. Brick sector experts, micro-finance institutions, civil society organizations and State and municipal authorities were also present. The Center for Human Rights and Environment (CHRE), which coordinates the Latin American Policy Advisory Network for Clean Brick Production (PAN LAC) — belonging to the UN’s Climate and Clean Air Coalition– and which has been assisting the State of Jalisco to develop a strategy to tackle a clean-up of its artisanal brick sector, was present at the event and gave opening remarks on the evolution and direction of the region’s artisanal brick production.